The world's first plant-based burger that looks, cooks, and satisfies like beef without gluten, soy, or GMOs. PERISHABLE – KEEP REFRIGERATED AND COOK THOROUGHLY BEFORE SERVING. USE WITHIN 3 DAYS OF OPENING. DO NOT REFREEZE. IF PURCHASED FROZEN, THAW IN THE REFRIGERATOR BEFORE COOKING AND CONSUME WITHIN 10 DAYS. PRE-HEAT GRILL OR PAN TO HIGH HEAT AND COOK FOR 4 MINUTES PER SIDE. DO NOT OVERCOOK. INTERIOR OF PATTY WILL STILL BE RED OR PINK WHEN FULLY COOKED. FULLY COOKED WHEN INTERNAL TEMPERATURE IS 165F. “Whether you're a proud carnivore, devoted vegetarian, or newbie vegan on the verge of caving, you've gotta throw this bad boy on the grill. The Beyond Burger is beyond juicy and meaty." “OK, literally sign me up to be a Beyond Meat spokesperson because these are crazy. The burgers tasted so much like meat that I had to go back and double-check the box to make sure these were, in fact, vegan." The Beyond Burger® is the world’s first plant-based burger that looks, cooks, and tastes like a fresh beef burger. It has all the juicy, meat deliciousness of a traditional burger, but comes with the upsides of a plant-based meal. The Beyond Burger® packs 20g of plant-based protein and has no GMOs, soy or gluten. I WANT A BEYOND BURGER®! WHERE CAN I GET ONE? You can find the Beyond Burger® in over 15,000 retail meat cases, restaurants, hotels and more! Use our locator to find the closest spot to you! Great question. Part of our Future of Protein vision is to re-imagine the meat section as the Protein Section of the store. In this way, we can help people on their journey to eating more plant-based by allowing them to purchase plant-based foods in the section of the store where they are already purchasing other forms of protein. No pun intended, but we are meeting people where they are in their food journey and offering an easy switch! Our belief is that the best way to get people to eat less meat is by giving them what they love–in this case, a juicy delicious burger – without so many of the health, sustainability, and animal welfare downside of a traditional animal-based burger. Dual-placement is a possibility but ultimately it’s up to the retailer. 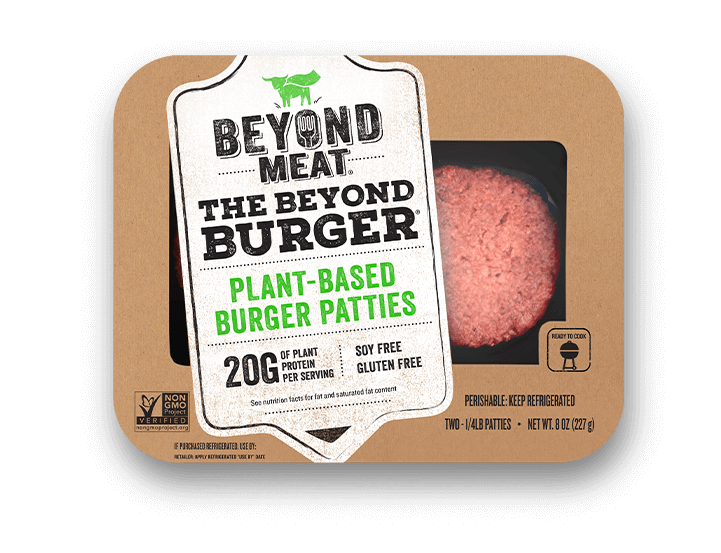 Our goal of placing The Beyond Burger® in, at a minimum, the meat section of the store is our attempt to help attract carnivores to the category and help change that meat case to the protein case. HOW LONG HAD THE BEYOND BURGER® BEEN IN DEVELOPMENT? HOW LONG CAN I KEEP THE BEYOND BURGER®? Be sure to check the “use-by date” marked on the front of your package. Once you’ve opened the package, however, they should be cooked and eaten within 2-3 days. Check the retailer-applied “use-by date” on the front of the package.